Bath and Body Works has a new coupon! Save 20% off your entire purchase with the coupon below! 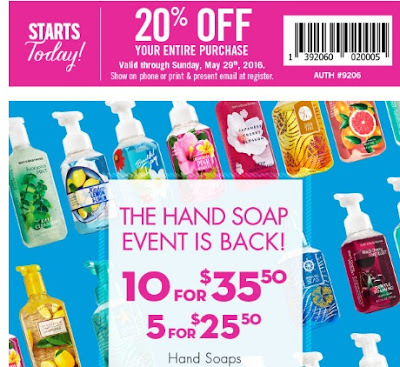 Plus their Hand Soap Event is back! Get 10 soaps for $35.50 or 5 for $25.50. Great to use in conjunction with this coupon. You can print the coupon, or just show it on your smartphone in the store. Coupon is valid until Sunday, May 29, 2016.